Man oh man did I need to regroup after the little soiree yesterday eve. The energy was electrifying and the drinks were stupefying so as a result I was nullified. There were two things that helped today; the eggs benedict I made this morning and was too out of it to photograph, and the tacos I had for lunch. Tacos are what cures you when the night before is what ails you, in fact there is a big ol' list of remedies but I wanted tacos. Crunchy, fried, blue corn tortillas and the rib meat from the barbecue the other day run through the grinder and seasoned all chile style. Three or four of these and you are ready for round two! I was a little bleary eyed when I posted last night but I wanted to get something up quickly. I took a little more time today and put this together. If it wasnt for the video camera I would not have remembered half of what happened! Beth was in town and she was being dragged about on some 'crawl' by David and his associates so I tagged along. I think someone slipped me a roofie.....LOL. Oh I forgot that Zombie Mom is here too but she went to a concert instead of this debauchery. Yesterday and today both my internet and cable went out from 10 in the morning until 6 in the evening, this puts a serious dent in my blogging schedule. Not only do I fall behind in my reader but I fall behind in my responses as well. So thank you very much Time Warner and even though you will credit me for two days it still doesnt bring those days back. 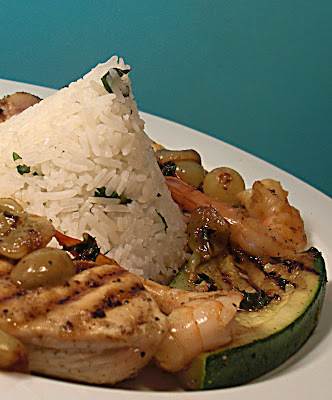 Mixed grill with shrimp, chicken and zucchini surrounding some mint jasmine rice and sauced off with grapes and gorgonzola. Time Warner can slow me down but they cant stop me. What do you think about mediocre or even less than that type of content all copyrighted like someone would ever want to steal it? I dont watermark my pictures or my content because I dare you to take it. Huh? Whats the deal here? Am I missing something? EDIT: I was feeling cranky on two levels when I wrote this: 1. the fact that people have the audacity to steal someone elses work and 2. I hate to see pictures, any pictures, all muddled up with watermarks because people have the audacity to steal....I posted this as an example of what bothers me most - big watermarks standing guard because it eventually will come to this! There is a difference between barbecue and grillin' and that difference is time. You grill up some hotdogs, for example, and you barbecue some ribs. I like grilled things. I like things cooked quick and to order. I also like things cooked slow, things that I can count on. Ribs that took a while to cook. Ribs that when you lifted the lid it was more smokey than a two dollar beer joint. Ribs after they had cooked a while, the smoke ring was sweet. 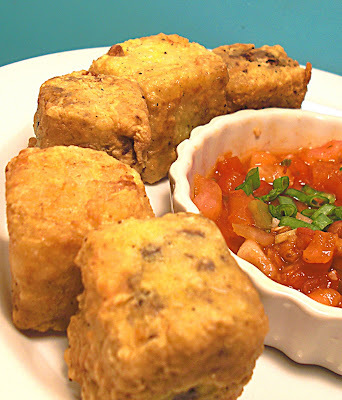 This blog should probably be named "rellenos" since I make them so often, and what does that mean? You guessed it, I made them again. 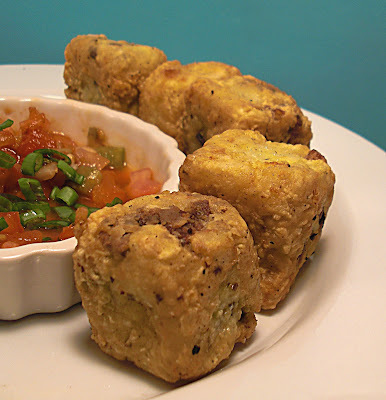 Chiles rellenos has got to be one of my most favorite things to eat and to share with others. 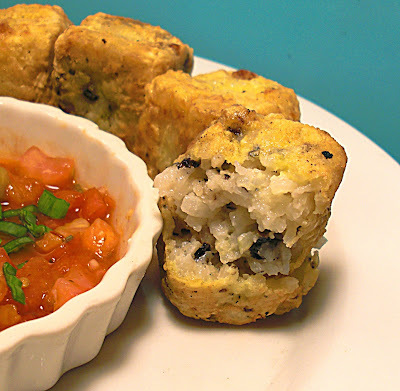 I have been asked to make rellenos for people for years and years now and I have a few different ways I make them. Sometimes I make a fluffy egg white batter other times I do the egg wash flour routine, it all depends on my mood. It really doesnt matter much how they get cooked as much as that they get cooked and quick. Serve them up however you want. Since I was already knee deep in hot oil why not throw some crabcakes onto the mix. Crabcakes? Sure crabcakes, I got some crabmeat nice and cheap in chinatown so why not. These ugly little babies have a nice gloppy dressing of red chile mayo to kick up the sweetness of the crab and they are served on a 'slaw' of broccoli and carrot. The same 'slaw' that surrounds the relleno. I say 'slaw' becasue it isnt really a true slaw as it has no dressing. I dont like the dressing that usually goes with slaw so I have mine either dry or with a splash of lime. So there you have it, two totally unrelated dishes held together with 'slaw' and chile - how do like them apples? "A thousand posts by summer - pshaw, how will you do that mister doggybloggy" I will tell you how.....cheating - thats how. Here is the first of, hopefully many, guest posts and this one is brought to you by my wonderful blog friends down in Georgia - TAVOLINI! My favorite aspect of blogging, (beyond actually just sharing my thoughts and opinions) is the blogging community. It's great to get to know your fellow writers. Tavo and I have read many of their blogs regularly for years, we comment back and forth, we see each other grow and change. One of our early readers, DoggyBloggy, was instrumental in keeping us blogging as well as entertaining us with the food he was cooking and eating. Needless to say, I felt more than honored to do a guest post on Chez What. So, how about some Artichoke, Havarti and Tomato Sandwich? We are in the process of moving back into our home, after a major house fire and a few months of DIYing a little rental bungalow we'd purchased in Atlanta. That, combined with a bit of pumpernickel, some artichokes, yellow mustard and a couple slices of Havarti yielded a quite the sandwich. I would have added some spinach, too, but mine had gotten a bit questionable. The best way to do this is just broil each ingredient, then layer and broil the next. It wasn't necessary with the heirloom, but roasting can definitely help an off season tomato taste a bit better. Focus has been a friend of mine for as long as I can remember, in fact I think its been longer than that. Hard to put down the magnifying glass when you use it on yourself. Bring on the scrutiny. Click here to learn the secrets of Zongzi and a nice tutorial. I have very definite opinions about mise en place I am certain of that. This is regular mise, mise suitable for everyday use. Empire State Burgers. Simple burgers make simple things that much nicer. Me and my yacker yacked myself into submission. How on earth will I ever get more posts done if I dont get more posts done, its a conundrum. Truth be told there hasnt been anything blog worthy lately and again thats entirely my fault. I dont always feel like putting it on a plate - sometimes I eat it right out of the pan with a wooden spoon dribbling it down my chin and all over my shirt. Dont believe me? Well then here is the anti-post of blog posts, one of those posts that was probably better left in the camera. Garganutan onions from South Texas burned on the grill. Hot dogs because they are too easy. Its fleet week here in NYC and that means service men and women from all over descend on the big apple and try and 'score' before they have to get back to business. HAPPY MEMORIAL DAY WEEKEND! dont blame who? what the hell? Recipes are visual aides and study guides for the most part and between you and me, once you learn how to do something you wont need the recipe. 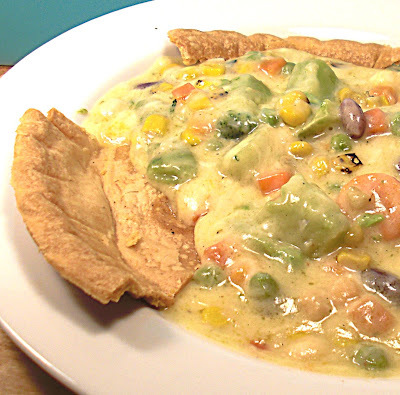 Lets look at pot pie. It has a crust and a filling. 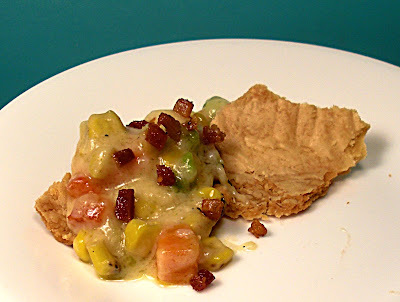 Lets make pot pie with a crust and a filling. I took every kind of frozen vegetable known to man and put them in a pan without any oil or salt because I wanted them to get southwestern brown; which they did. I made a very cheesy bechamel and I tossed those south of the border veggies right in. Trying to close that 190 gap....I wanna hit 1000 before summer is over. You know, I've got so many irons in the fire I am surprised I havent been branded twice. Dang if it all dont just turn into work after a while. You write a nice sentence or two and then everybody starts asking you to do it again. Flattery gets you everywhere so I comply but as a result I have lagged behind in my posts and then I try and get by with a 'filler' like this one. If you 0nly knew the long heavy silences between each captivating line you would fully understand. Y'all know me one way but what throws the coins my way, and I mean 'coins' and mostly dimes and nickles and a few quarters and rarely still half and full dollars, is I write or dictate to someone who does. I used to write ad copy, I have written an odd piece (I was Ranch Handler) here and there, some brochure type stuff - you know stuff like that so I dont shy away from that type of work - key word here is work and I am always happy to do it again. Problem with working is it takes away from doing other things that are also work related, or so I would hope, and that is maintaining the blog. I passed the 800 mark on posts the other day and when the 1000 rolls around you know there is going to be a party. Here is the deal I am at 806 with this one that means I have 194 to go - we're looking at December for this party unless I start doubling up, what do I do? You see - skipping days isnt helping anyone! Why make a ball when you can make a cube? The sphere is nice, its even, its perfect in so many ways but a cube has character. The only thing that can trump a cube is a pyramid. 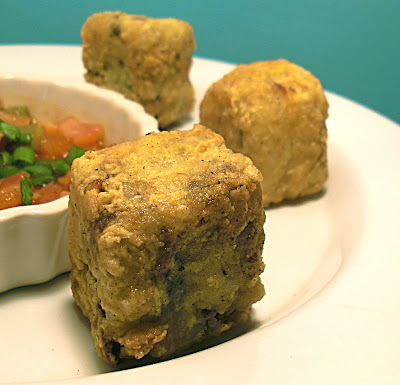 Fried risotto cubes with a chipotle pico de gallo. Take that and put it where your fusion sun dont shine. I had left over risotto so the next logical step was to make these tasty appetizers. I have had fried risotto balls, in fact they might even have their own name (they do they are called arancini de riso) well thank you blog answer guru - anyway they are usually served with a spicy marinara sauce. 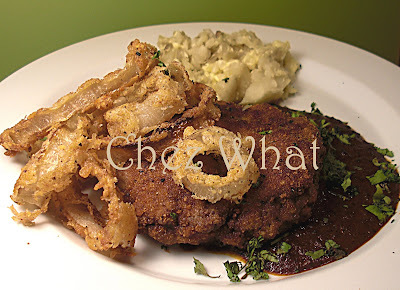 The sauce seems like the same sauce you would serve with fried calamari, its good but a chipotle pico de gallo is better. Risotto is a labor of love. 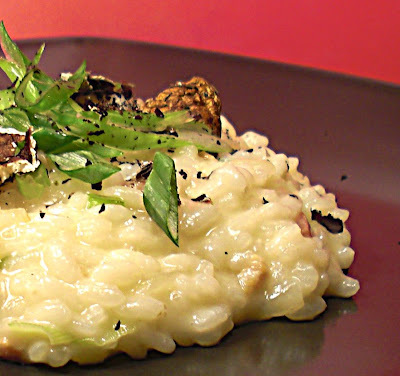 To get creamy smooth risotto and still not have mushy rice is a skill worth learning. The risotto is creamy and cheesey with the salty bite from the pancetta balanced nicely with the earthiness from the mushrooms.